All aboard the 600'-tower train in downtown Bellevue! 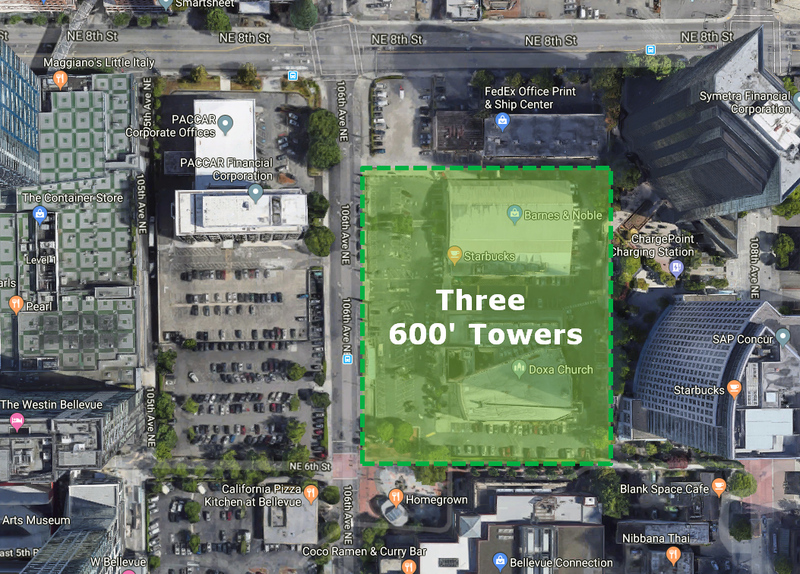 Onni Group, a Vancouver, BC-based real estate development group, just submitted a proposal to construct three 600-foot towers in downtown Bellevue. Earlier this year, Vulcan was the first with a proposed project to construct a 600' office tower. 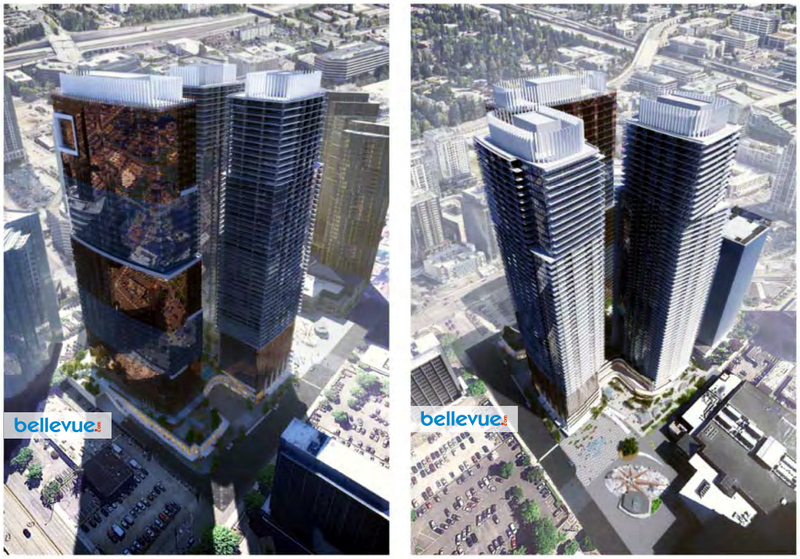 Onni's proposed project calls for three 600-foot towers over a 40-foot tall podium, and 6 levels of underground parking with some 2,300 parking stalls, totaling 3,507,371 gross square feet. Two of the towers (T1 & T2) are residential with T1 having a hotel component; the other (T3) is commercial office. A total of 1,289 residences, 317 hotel suites, and 896,000 sf of commercial office space is proposed. Private amenity areas, featuring two swimming pools, a 7,500-sf daycare, 34,000-sf retail, 22,000-sf food court, and 7,500-sf restaurant are planned. The proposed project is targeting a LEED Gold rating. The project site is located at 606 & 620 106th Avenue NE, currently occupied by Barnes & Noble and Doxa Church. The site is adjacent to the Bellevue Grand Connection. 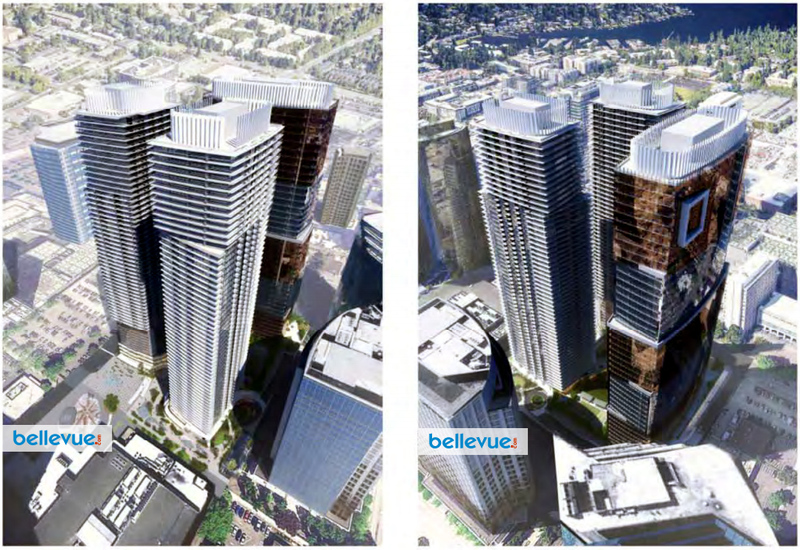 Compass Plaza, which is located on the south side of the Bellevue Grand Connection, will be enlarged and improved northeastward as part of this proposal. The project will require demolition of surface parking and all existing buildings on the site. 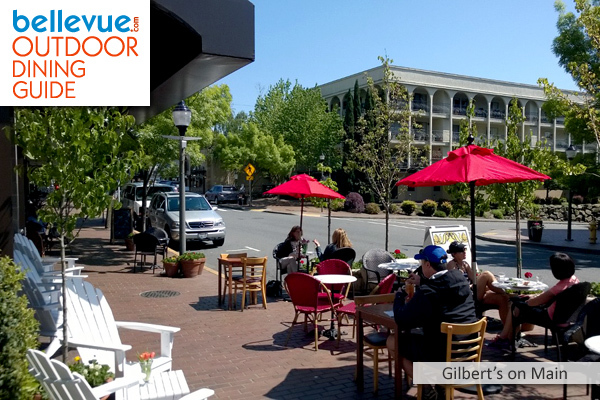 Demolition for and construction of the proposed project is planned to commence in February 2020, with Office Occupancy planned to occur by March 2023, and Residential & Hotel Occupancy planned to occur by April 2024.